The modern farmer must be well equipped to comply with market standards as well as meet the numerous challenges posed by the ever-changing agri-business landscape. Dudutech Training Department provides training and information on Good Agri-Practices aimed at giving its clients practical skills, knowledge and confidence to make ecologically, socially and economically sound decisions on crop health. To this end we offer a range of standard as well as tailor-made courses to meet our clients’ specific needs. These can be conducted either centrally at our well appointed Dudutech Training Centre in Naivasha, or on farm, which is logistically favourable to most clients as the workers are not off site for long periods. Dudutech has been providing training in various aspects of horticultural production since its inception. All these have undergone peer review and accreditation by Kenya Agricultural Research Institute (KARI), the premier parastatal undertaking agricultural research. Dudutech is also accredited as a training provider by NITA. In 2009, Dudutech qualified as a COLEACP/PIP training provider consultant for Kenya and Uganda regions. This is a European Development Fund (EDF) funded project aiming to assist exporters in the ACP (African, Caribbean and Pacific) countries comply with market requirements for food safety and traceability. Training is a combination of technical work, hands on training and field work. All courses except awareness courses are followed up with written or oral examinations, in English or Swahili. Certificates are issued to all successful participants if they pass their examinations. Dudutech has a set of industry standard courses designed to comply with the various audit standards, and courses to promote good crop husbandry, post harvest management, safe use of chemicals, plant nutirtion, and Integrated Crop Management, for maximum residue level reduction in crops. Dudutech can also custom build courses designed specially for your company, crop, audit or market requirements. meet the needs of a wide range of clients. Our training department is registered by the National Industrial Training Authority (NITA) formerly Directorate of Industrial Training (DIT) as a training service provider under the name Finlays Horticulture (K) Ltd.
Dudutech embraces ‘Participatory Learner Centred Approach’ to training and shall apply: topical presentations, demonstrations, group discussions, practical site visits and role plays as appropriate. Trainees are awarded certificates of attainment upon passing the examination. The growing globalization of agricultural production and trade coupled with the increasingly stringent national and international legislation means that today's agricultural sector must respect ever stricter standards and increasingly rigorous quality control and monitoring procedures. Moreover, production, distribution and marketing of fresh produce have changed dramatically worldwide with majority of the fresh produce being produced offshore, transported long distances by air and refrigerated trucks handled by a number of distributors, wholesalers and retailers before being sold to the consumer 6 to 10 days after harvest. Several biotic and abiotic factors influence the quality of produce resulting in natural variation in produce characteristics. This course aims at equipping harvesters and postharvest staff with industry level skills and expertise in the day to day postharvest management of fresh produce thus ensuring consistency in the maintenance of quality of flowers and fresh produce. While pesticides are an integral component of modern agricultural systems, they are hazardous to human and environmental health. Safe and effective use of pesticides course is designed to provide the participant with sound knowledge and skills on the principles and practice of pesticide usage in line with Good Agricultural Practice (GAP). It is relevant to all those involved in pesticide usage and handling at different levels i.e. spray applicators, spray supervisors, storekeepers, tractor drivers etc. The syllabus and practical competence tests have been designed to enable compliance with international audit standards such as GLOBALGAP, Rainforest Alliance and FLO. It also takes consideration of Industry standards like Kenya Flower Council (KFC) as well as statutory obligations. Fertilizers are important inputs in agricultural production as they improve the quantity and quality of produce. Development of best management practices for efficient application and reduction or elimination of nutrient contamination in irrigation effluent is paramount. 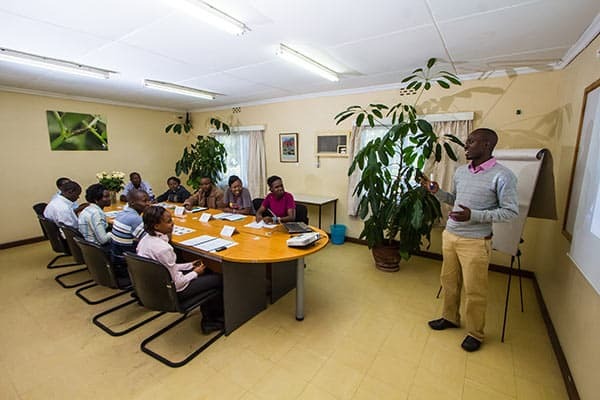 This course is designed to equip the trainees with basic principles of plant nutrition, fertilizers, and irrigation to effectively provide advice and make decisions on production activities in the farm concerning irrigation and fertigation. Recycling organic materials into composts and compost-based soil products requires knowledge of a wide range of science, engineering, materials handling, equipment maintenance, etc. Concerned staff must demonstrate at least a fundamental understanding of the basics in many of these fields to avoid operational problems and difficulties that can occur on a variety of fronts. This course is aimed at providing participants with an understanding of the composting process as a technology for the recovery and recycling of biological waste into a valid product for agriculture.